Ever since we moved in to our first house and I was shocked by how expensive curtains are, I have made my own. I am in no way an expert but I do know how to sew straight lines on a sewing machine! And with each pair, I have got a little bit better. We have large floor-to-ceiling windows either side of patio doors which, when we moved in, had some depressingly characterless beige curtains on a grey plastic pole. They weren’t far behind the smoke-stained net curtains into the skip. I know not everyone would agree but no window dressing is better than an ugly one in my book. In fact, in our first house we had brown paper over the bay window right next to the pavement for so long that when we finally put in blinds one of our closest friends thought he had come to the wrong house! Anyone who’s been to my house over the past year knows that these curtains have been a long time coming. A lonely one hung by itself. Then the second flapped unhemmed while toddlers played peekaboo with it. 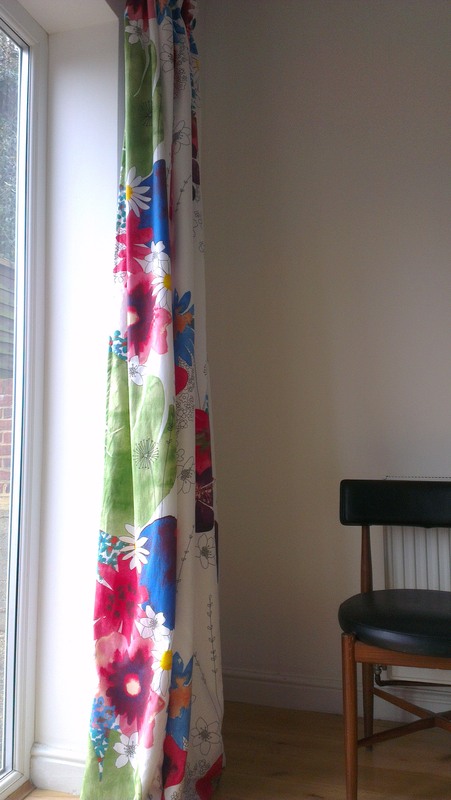 But today is the day when we finally have two finished curtains. The fabric was from Ikea about a year ago but I can’t find it on their website now. I love their fabric (mostly because it is such good value) and this is my kind of floral. I’m not a hundred per cent sure that the range of colours in the fabric work completely with the acid yellow and black wallpaper at the living end of the room but they give the dining area a more distinctive character and work beautifully with the black, white and apple green in the kitchen area. One day I’ll make more grown up curtains – like these beautiful ones Bright Bazaar made – but I like not feeling too precious about them. I lined them as the fabric was a little too thin otherwise and I’m very pleased with the blind hem stitch that I did by hand for the first time. I think a new pair of curtain finials (that actually fit the pole) will finish it all off a treat.